In my career, I have had the great privilege to witness different companies undergo many different phases of agile transformations. I’ve met many amazing Scrum Masters along the way that have evolved to take on major responsibilities in their organizations. However, I have also seen many Scrum Masters who fall into common traps that impede the Scrum team, impede delivery, and inadvertently slow down their own career growth by falling into five common traps that I have identified. I’ll identify these common mistakes and offer ways to best avoid them or get out of an invisible sinking tar pit that frequently pulls new Scrum Masters into their demise and show you how to get back on the path towards becoming a great Scrum Master. When do you and the development team look at the Sprint burn-down chart? Is it only in the Sprint Retrospective? Does the Product Owner have to plan releases? If so, do they have a release plan based on reality? As a Scrum development team gets work done, there are opportunities to capture meaningful data. I would look to metrics like velocity to understand how much complex work a development team can complete per-sprint while working at a sustainable pace. Used appropriately, this information can be used to build a release plan and release burndown (Jira’s “Version Report” does a nice job.) Look at defect rates and expose opportunities to build fewer expensive defects by applying modern software craftsmanship techniques whenever possible. Test-driven design (a form of mistake-proofing), pair programming, and behavior driven development can all help to help maximize your use of data. 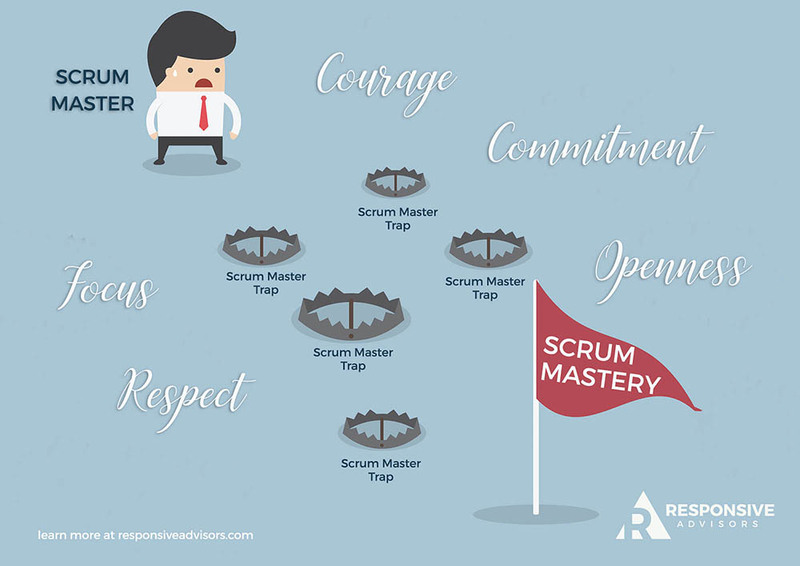 Now that you are aware of the five common traps Scrum Masters fall into, I hope you will do your best to avoid them, help your colleagues avoid them, and work on getting yourself out of any pitfall you may currently find yourself in. If you’re serious about becoming the best Scrum Master you can be, read my Top Book Recommendations for Scrum Change Agents blog or learn about Scrum Master certification with the two-day Professional Scrum Master class. Let’s change the world of software development to a state in which the word “agile” is more than just passing fad and buzzword of the moment. We can’t do that if Scrum Masters aren’t properly teaching and promoting the Scrum Framework and relentlessly seeking to remove impediments. If you fall into these five traps you’ll find great difficulty in becoming a great Scrum Master. Every Scrum Master should continuously seek to uphold the five values of Scrum: courage, focus, commitment, respect, and openness to work towards a lifetime goal of Scrum mastery.